Does mongrel make a difference? Sport is one of those things that makes 'experts' of all us. Armed with little more than an armchair and a pint we're transformed into the love-child of Brearly and Warne. Today, experts from the pub to the media centre unaminously unravelled the mystery of Australia's limping tour: misplaced 'mongrel'. No doubt related to that slippery aura they can't locate, Australia apparently have lost the agression, fire and filth that made them a great side. But do body language, sledging and Jelly Beans really matter? If you have the tools, probably not. Warne & McGrath could have bowled sides out without uttering a word. That they did sledge, and to great effect, was still product of their talent. But if you have a side lacking world-class ability, inspiration needs to come from elsewhere. When Hussain and Fletcher took charge of England, their first effort was charged at improving the physical presence of their team. They stuck a backbone into a flaccid team by insisting on stronger body langauge and stronger words. To win games you need to exert your character and belief over the opposition. Today Australia failed to do that. 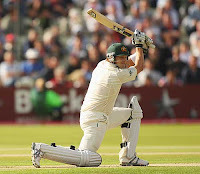 Opening the batting was once the hardest position in Test Cricket. In heady days when pitches were prepared for cricket and not chief executives, the position demanded patience, technique and stubbornness. Gavaskar and Boycott. These days Shane Watson will do. With a Test average of 19 and a first class record of 9 opening the batting, he looked a curious option. Yet England dished up a buffet of long-hops and half volleys and Watson tucked in. Adopting, like Trescothick four years ago, the gung-ho approach that a one-nil deficient affords, he powered Australia to a strong position. For a team as mediocre as England have been in recent years, they are inexplicably complacent. Time and again they get ahead and promptly lose interest. It is a relief they didn’t bat first today. Strauss retreated to his conservative worst as he reproduced captaincy clichés. When Graeme Swann’s effervescence brought a wicket, the spinner should have bowled for the rest of the day. Instead Strauss returned to Anderson, who suggested again that he is primarily a grey-weather bowler. Ponting looks imperious and on a flat pitch if England are still napping tomorrow he could punish their carelessness. The series is deliciously poised. England's injuries and Ponting's mongrel could make for an intriguing Edgbaston Test. Over the next eight days however, I have to salvage my masters dissertation - on the politics of financial speculation - from the torrent of Ashes cricket that threatens to destroy it forever. In a contest between evenly matched teams, results can be determined by the briefest moments. The first hour this morning was one of those defining periods. With England’s jitters and Clarke’s belief, you felt that between Australia and the history books stood only the new-ball spell from Andrew Flintoff. Having announced his retirement from an unfulfilled career, the pressure was on body and mind to demonstrate they could rise to these occasions. Duly, they did. It’s only the great players who possess the ineffable ability to claim crucial moments as their own. Shane Warne, for instance, could turn entire series with the sheer strength of his personality. Today Flintoff touched that greatness once more as he bowled England to a one-nil lead. It was a sight to cherish - the appalling state of Test pitches coupled with an unrelenting schedule threaten to kill off express-pace bowling altogether. Yet Flintoff, a high calibre casualty, produced one of the great hostile spells. Running on one-knee and buckets of adrenalin he took three wickets bowling unchanged for 13 searing overs. Again he dared to go full and again he was rewarded. Few get the privilege of leaving top-level sport on a high, and Flintoff still has three games to go. But victory, the man-of-the-match and the Lord’s honours board is quite a way to launch the farewell. Momentum is a precarious category in sport. A seamless explanation for a run of play, it suddenly loses all relevance when that run of play changes. England began the day with the momentum propelling their historic mission. Flintoff, in what may yet be his last Test for England, finally located the length that eluded his entire career. He pitched the ball up sufficiently to find, rather than pass, the edges of Katich and Hughes. As Swann found a verve that Panesar couldn't last year to reduce Australia to 128 - 5, the 'momentum' was firmly with England. And then nothing. Michael Clarke's silky footwork and breezy confidence found a willing partner in Brad Haddin as Australia fought back. Gently and with growing certainty they dominated England. It was a measure of how flat England had become that Andrew Strauss felt compelled to call an emergency huddle before the second new ball. England, haunted by Chennai, looked increasingly panicked as the second new ball failed to deliver the wicket. Such was their control, Clarke and Haddin would have been tempted to stay out there when shadows stopped play for the day. With rested bowlers and 200 runs still in the bank, their lead is surely 'too big to fail', but we've thought that before. Modern pitches and Australia's unwavering belief make anything possible. England, though, will take heart that with just one wicket, the 'momentum' will suddenly be theirs again. Sadly, I was unable to see any action today since I was playing cricket myself. I bowled too many full-tosses. Seemed like a good day for England but be wary. The declaration should allow for three new balls, might just be key. It had to be now. James Anderson has been in and on the fringes of Test cricket for six years. Having promised much for the past year, this was the series he had to deliver. He is a complex character, Nasser Hussain found it “impossible to get into his head”, the hardest person he ever captained. Nass needn’t have bothered: the answers were in the skies. Jimmy is a Burnley lad and, fittingly, nothing cheers him up more than grey skies. They bring the swing that transforms his game. Earlier today he again had to reprieve the England batsmen. His unassuming presence off the field can mask his steel. The Cardiff heroics were today followed by a clever, counter-attacking stand with Graham Onions. It was apparent in his shot selection that he understood the game situation. Given the conditions yesterday 425 was horridly below par, under dark coulds however, it looked a lot brighter. Many felt before this series that if England were to be successful, Anderson had to be key. Over his punctuated career he has been unable to find the consistency and wickets that define leading bowlers. As ever the margins are decided in the head. In the past year he’s had the responsibility of leading the attack. Forcing an introverted character, under the glare of Test cricket, to carry a weak attack was a decision forced on England. Yet it has worked wonders for Anderson. Today, he never more than threatened swing, but maintained control and changed the angle from the crease well. He was aided by some loose batting from Australia. Hughes, Clarke and North will be disappointed with their dismissals. The question that could decide this Test and possibly the series, is what Anderson can do when the skies clear. England have had much the better of the conditions so far. Should the sun shine on Ricky Ponting tomorrow, England, haunted by the memories of Chennai, will be praying Anderson can lift them. It appears England are unwilling to learn from their mistakes. Following their careless first-innings in Cardiff they were subjected to lesson in flint-eyed desire from Ricky Ponting. Today it was Andrew Strauss, every bit as determined, who showed them the way. Again, they refused to follow. Gifted a platform by their openers and some indifferent Aussie bowling, England reverted after tea to charity cricket, donating their wickets with carefree abandon. Australians don’t need help to win games and if England fail to get past 450, they will consider themselves on top. England can take heart from another under-whelming performance by Australia’s strike bowler, Mitchell Johnson. He arrived on these shores touted as the worlds best quick and potentially the difference between the sides. Much like Dale Steyn last summer and Brett Lee in 2001, he's failed to match the billing. It was left to the impressive Hilfenhaus, fast becoming the best bowler on either side, to carry the attack. Steeped in history and grandeur Lord’s is, in some sense the true ‘home of cricket’: it epitomises the smug and snooty atmosphere that once defined the sport. Much of the crowd were disinterested in anything beyond sunglasses and champagne. The reception offered to Kevin Pietersen, as he arrived at the wicket, was as icy as it was ignorant. Perhaps it’s this most ugly side of Englishness here that inspired Australians over the years to hammer the poms. Tomorrow much will depend on how Australia use the new ball. With Strauss and a strong lower order, England can yet command the game, but an early strike and Australia will feel confident of emulating Cardiff. It seemed, as Flintoff creaked into his 35th over at Cardiff, that his captain was bowling him to an injury. Worse, Strauss succeeded in bowling Flintoff into early retirement. Truth be told, this was on the horizon for a while. His fitness and form since 2005 has been a travesty. Time and again the cycle of injury, gloom, rehab and hope gripped the England side's perennial search for 'balance'. It was Lawrence Booth, in his insightful weekly column, who first questioned the point of it all. Now journalists and punters alike readily cite the fact that England win more games without 'Fred' than with him. Statistics, though, are full of quirks. Flintoff struggled through the top sides - South Africa, India, Australia - but was left rehabilitating as others gorged on West Indies and New Zealand. This however, cannot mask the fact that Flintoff only ever flirted with greatness. For three years under Michael Vaughan, culminating in that series he was possibly the most valuable cricketer on the planet. Since, he has failed to be the force on the field that he is off it. While in an England shirt, Flintoff couldn't prevent forcing his body beyond endurance. He carried not only his colossal frame, but a toothless attack. Yet off the field, the riches from 2005 and frustrations of injury led to an increasingly public presence away from cricket. Perhaps the fire that drove him to the top was fading as he sought fortune and entertainment elsewhere. The tragedy is that this series had appeared to light the embers once more. He was better prepared than any since 2005, was batting well and thundered in bowling faster than ever. Alas, his body duly resisted. He deserves a vintage performance to close his Test career and could yet inject himself to fitness for the remainder of the series. Sadly public figures, sportsmen especially, rarely get the exit they desire. Whatever happens, Test cricket, shorn of Flintoff's brutal brilliance, will be a poorer sport. For five days Australia outplayed their opponents, yet it's England who end celebrating. On an extended day, England had to defy the Aussie bowlers and themselves in their bid to salvage a result from a pitiful performance. It's the sort of situation that defines the English sporting psyche: backs-to-the-wall defiance, almost irrespective of outcome, is always more romantic than clinical victory. Forget 'Jerusalem', 'The Great Escape' is our national sporting anthem. Despite affinity to the idea, escape is something England rarely manage and it took the iron will of Paul Collingwood to give them a glimpse. He batted with desire, skill and plenty of nous to carry England to Lord's unscathed and deserves all the plaudits that will come his way. Yet beyond relief there are only doubts for England to take from this match. Ricky Ponting, on the other hand, should carry no concerns to London for the next test. From the outset Australia capitalised on inexplicable complacency from England. Their planning and execution in England's first innings, aided by the charity of the England batsmen, made for an attack stronger on grass than paper. England's top order has spluttered since the end of Duncan Fletcher's reign but again, it's the bowlers who will feel the selectors axe. Monty, finally a hero finishing a game for England (sadly only with the bat), should give way to Graham Onions. Andrew Flintoff, the one-time national treasure, continues to bowl too short. We can gasp as he passes the outside-edge all we like, but until he draws batsmen forward he won't get the wickets his talent warrants. England cannot afford to carry him and Stuart Broad in their attack. 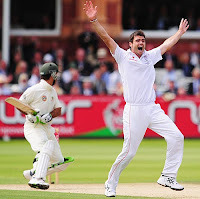 Though the latter should survive to Lord's, his potential needs to be matched with wickets or the case for Steve Harmison, another perennial underachiever, will become irresistible. Australia will commiserate and England will celebrate, but both should take satisfaction that this series, so often drowned in the fanfare of 2005, has found its voice. It has taken just four days for anticipation to turn to despair. It sounds familiar but unlike the last Ashes series, talent doesn't separate these teams. So what does? Test cricket is an examination of skill, fitness and ultimately desire. Unlike the shortened format there is no defined escape, no artificial breaks and no contrived opportunities. You are subjected solely to the will of the opposition. If, like Australia, they are intent on remorseless punishment, then that is what you receive. Batting first on a flat pitch England had an opportunity to boss the game. All the batsmen made starts and none made a hundred. Pietersen rightly attracts attention and, as I said at the time, his dismissal could decide this test match, but all the batsmen were at fault. Prior and Flintoff’s breezy partnership was enjoyable but never match winning. The England players and supporters were content to see a dash to 400, rather than a grind to 600. Four years ago it made sense, but this Australian attack does not demand a gung-ho approach. The England batsmen should have the belief and desire to bat Australia out of contention. Today England left their hearts and brains in the dressing room waiting for rain while Haddin and North tore them to pieces. Ponting may not match Warne tactically, but he inspires his team and has out-manoeuvred Strauss by a distance. Before the post-mortem, England has an opportunity exert their character on Australia tomorrow. A final day pitch soaked in pressure is always full of gremlins, but England need to demonstrate their desire for this contest. Their approach has to be positive and as ever, a lot will fall on the shoulders of KP. It's not without irony that Nathan Hauritz, much derided, presents their biggest headache. There is a remorselessness to everything Ricky Ponting does. His demeanour may endear few but his record should inspire many. With just a single century in his previous 21 innings, murmurs about his form and a sketchy performance in the field, Ponting arrived at the wicket in need of runs. Test cricket ruthlessly reveals the inner-most character of its protagonists, exposing people for public consumption like no reality show ever can. This innings proved, as if we needed reminding, that Ponting is cut from nothing but steel. If he had any doubts about himself or his team, which following England's plucky lower-order hitting would be understandable, they did not show. Every movement had utter certainty, which, when added to his instant judgement of length makes for a formidable batsman. The conviction and unrelenting purpose that Ponting brings to his talent separates him from Pietersen and could end up separating these sides. England's bowlers toiled but neither of their celebrated "two spinners" could turn the ball as much as Hauritz. Should the new ball bring no reward, Australia could march into a commanding position. A deficit of 200 on the final day would leave England praying for a Ponting of their own. With the eyes of the world watching the first day of the Ashes 2009 unfolded by stealth. The backdrop of 05 loomed throughout the build up and continued into today. Beyond its marketing prowess its constant presence does little to help the game. Sky’s coverage is a bit like an ageing parent trying to be in with your mates. Despite the stream of video montages to Oasis and other household forgettables, they failed to capture the anticipation or magnitude of the moment. And for a series defined by its history, Cardiff, which has seen no part of it, was the wrong place to start. The cricket, it seemed, would need to write its own story. The day ebbed, flowed and meandered like only Test cricket can. Australia’s attack, impressive but charmless characterised the new Australia. This era is patient and conservative, rather than brave. Ponting’s defensive fields will be criticised but he will feel justified by the fact England never got away. England’s approach had a shades of the do-or-die Vaughan era, but this Aussie attack didn’t warrant it. Much will be said about KP’s shot. Despite his protests, limp paddles are not ‘the way he plays’. I would much rather he slogged to long-off. Batting first England should want 400 and would feel unsatisfied. Anything below 360 tomorrow and its advantage Australia. These moments, before hope gets blunted with experience, are among the purist for sports fans. Every prediction, even McGrath’s five-nil ritual, carries significance, every outcome possible and every history yet to be made. Anticipation may, just, be even more thrilling than even victory. With just one more sleep until the action starts the teams could not look more equal. Gone, with Warne, McGrath, Hayden and Gilchrist, is Australia’s wall of impossibility. Gone, with the progress of Strauss and Flower, is England’s air of hopelessness. The “chief-executive” pitch at Cardiff promises an attritional rather than spectacular start to the series. Despite cunning plots and hours of hawk-eyed analyses, one prediction remains certain: the outcome will, as ever, be decided by which team bats, fields and especially bowls better.Yet, one of cricket’s many pleasures is how the flair, skill and enterprise of the individual affects the fortune of the collective. Johnson’s struggle with Pietersen and Anderson’s with Hughes will be captivating viewing and could prove decisive to the series.English sports fans suffer from a curious optimism before any big event, and I am no exception. At home, and with a more varied attack, I expect a slow, tight series that England wins 2-1. Come 11am tomorrow, bounding white figures will pepper the unfamiliar turf of the Cardiff and completely engulf our minds. The smallest deviation of the ball will move both the batsmen and millions of people around world watching it. Finally, for us fans, the time for talk has begun.